Customize each section with family member names, birth years, and hobbies or traits. Inspired by the heirloom quilts once crafted across the country, this updated take celebrates the stories of a truly special community—your family. Customize each section with a family member's name, birth year, and hobbies or traits. 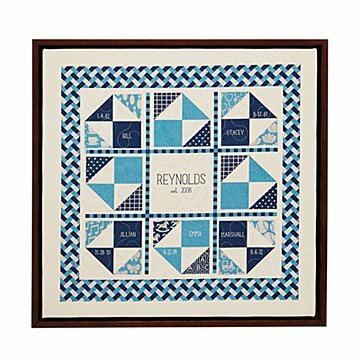 The personalized blocks are printed on canvas that's stitched to give the design the look and feel of a traditional American quilt. Beautifully framed in your choice of warm brown or classic black wood, it's a tug-at-the-heartstrings kind of gift for grandparents and new parents alike. Printed and embroidered in Brooklyn, New York. Framed in Hackensack, New Jersey. See the customization instructions and complete list of available icon patterns. Check out the Fabric of Our Family Blanket - Americana here.